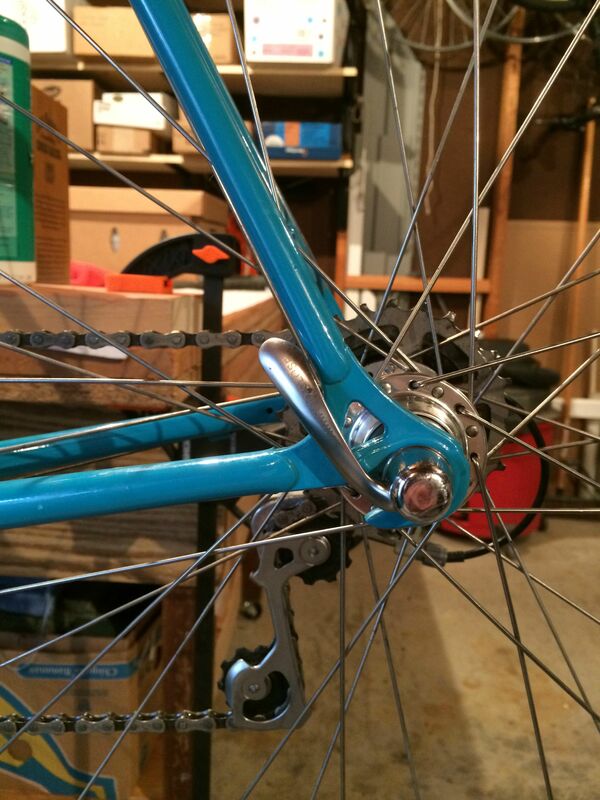 parallel to the seat stay, or parallel to the chain stay? Sure did botch the title up 'eh? Maybe a mod could fix it for me...please? I like the first option, or something between the two. Either is fine though. Just not out the back. Option 2, but more in the middle of the stays. Plus, this way the end of the skewer can double as a pump peg. Only two choices? I like 2 o'clock. I've been told that both skewer handles should be pointing towards the center of the bike, so mine are usually somewhere between. Not that I always do what I'm told. Or so I'm told. 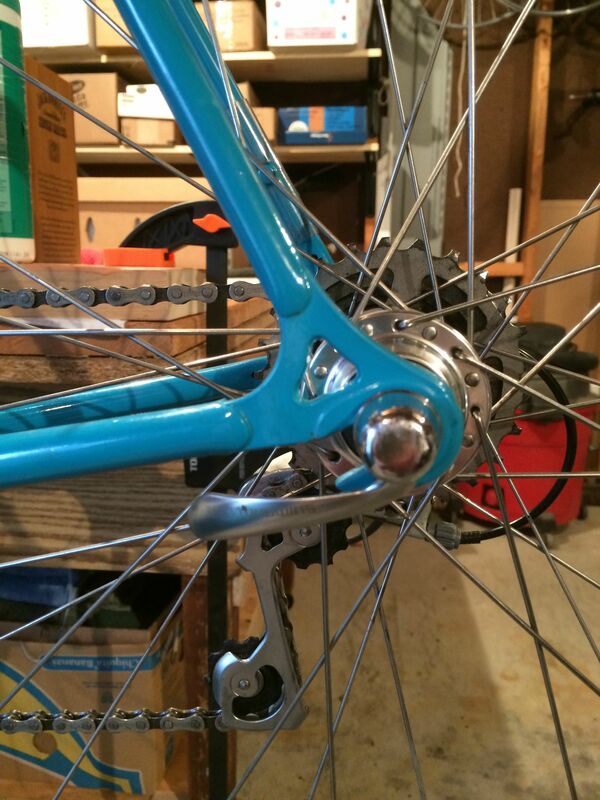 front mimics fork; rear mimics chain stay. +1, which I believe means door #1 . I have a buddy (ex-racer, fellow musician, the guy who gave me the Masi frame) who argues that option 1 could let a stick bounce up into the lever and open it. I say hogwash. First, it would have to be one heckuva stick to exert that much force. 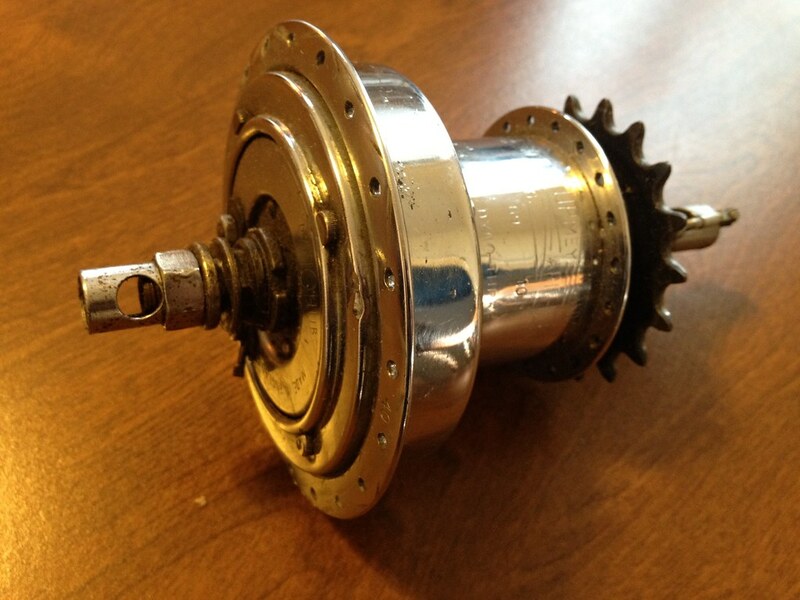 Second, it would have to get inside my crank and pedal. Regardless, they look better if done as eschlwc says. Rear faces forward along chainstay, front faces straight back - to cut aerodynamic drag, doncha know ! .... Just not out the back. I set mine up so the writing is right side up, front and back the same, going for that aerodynamic (blowing in the wind) look. In other words, out the back. I guess that settles it- I'm going out to change all mine right now. As I recall we all did it the way Eddy demonstrates (based on theories of catching someone else's bike, spearing yourself in a crash, etc.) until curved QRs were introduced. After that it was anarchy! There it is. I've always positioned the ends pointing back at my competition....not to mention it is aero. My dad always said to point both front and rear skewer levers straight toward the back because if they're forward facing, they could snag on something while riding. The picture of Eddy's bike seals the deal. I agree with post number 7, although I don't think it makes any difference. That's the way I've always done it. As Sheldon Brown suggested, wrapping your fingers around the stay helps with the squeeze. I don't care what Eddie's mechanic did that day. 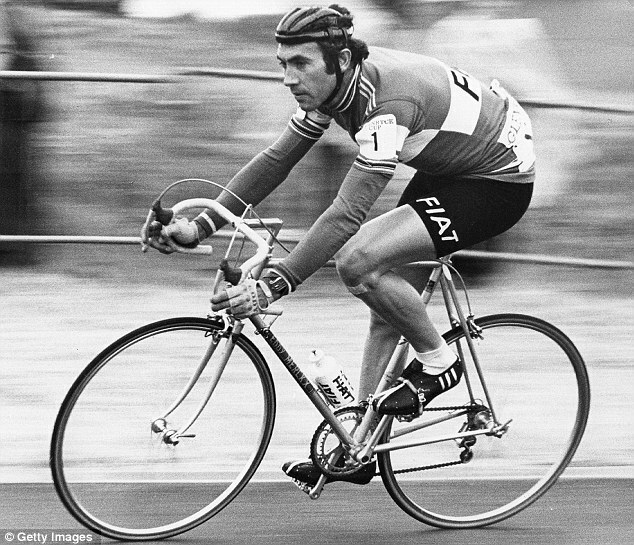 A search for Eddie's pictures will reveal that he didn't always ride with the levers oriented that way. He probably didn't think it made any difference, either. Skewer? Like this? Just keep the pointy end pointing away. My bikes are like this. Last edited by photogravity; 04-26-14 at 11:19 AM. I worked at a bike ship in high school in the early '80s. I was a BMX kid at the time so the owner taught me how to work on road bikes, etc. The skewer position in this photo is how he told me to position them, so that's how I've always done it. I have been pointing mine at 2:00 for a while now. I like both skewers pointing in the same direction and 2:00 gives that feather in the cap aero look. It all boils down to what you think looks best aesthetically. To my eye pointing forward with the chainstay just looks awekward. 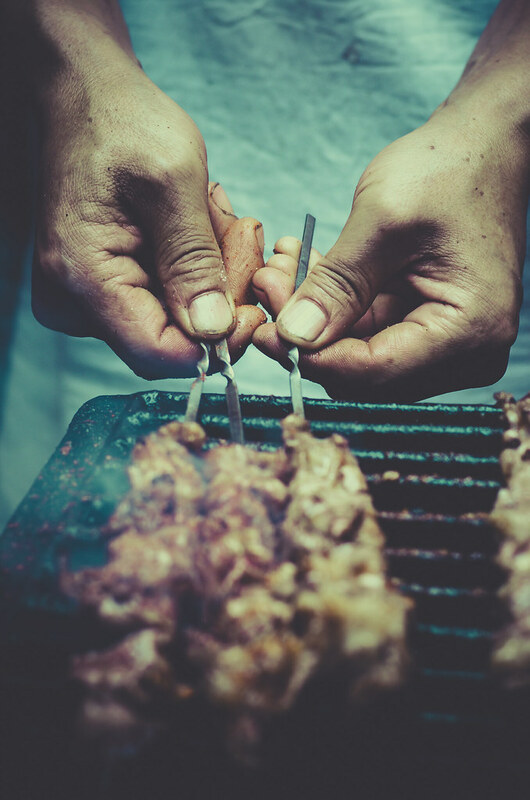 I always point both skewers rearward at about 2 pm. The levers look best aligned with each other, and flowing rearward looks faaaast. For the front, it depends on what type of skewer. If the lever isn't curved and you position towards the rear as the Eddy depiction, it might mark the fork blade. Man, he really looks comfortable on the bike. Gotta dial in my position. Small flange hubs too. Everyone switched to small flange when Eddie started riding them. Last edited by norskagent; 04-26-14 at 04:35 PM. I put the rear lever about half way between the two stays. It doesn't follow either one, but rather hits the middle-ish spot that lets it tuck in the furthest. That also allows me to use my thumb against the chain stay to pry the lever open more easily.